Update [September 26, 2016]: We have added a new solution below, which involved resetting your wireless settings. See it below, it’s the solution no. 1 below, as we have replaced the first one earlier to second, 2nd to 3rd, and so on. On September 14, Android team has recognized the issue and are working on it to fix it. Find more info at the Issue Tracker page here. That the battery drain is because of Bluetooth, and Bluetooth only, is pretty clear as switching it off results in proper battery life. We’re hearing reports from many users complaining about the issues with Bluetooth on Android 7.0 Nougat, mostly on Nexus 6P and Nexus 5X, among all devices to run Nougat right now. It’s being said that Bluetooth worked fine on Android 6.0.1 Marshmallow, or Android N Developer Preview 5, but after upgrading to Nougat, it’s either crashing, disconnecting automatically after a minute or two, or just won’t connect. We take a look at the various Bluetooth issues bothering the users on Android Nougat, and possible fixes — don’t be shy to try them all if one solution doesn’t works out for you. After connecting the Nougat running device to your car or headset, it would connect all fine, but would end up disconnecting automatically after a while, let’s say in 1-2 minutes. To fix, look for solution no. 1 below, and if that doesn’t helps, then go for 2nd one, 3rd one, and then the last one (reset). If you were able to connect your device via Bluetooth to car earlier, but not after upgrading to Android 7.0 Nougat update, then this is an issue. You could get errors like ‘Can’t communicate with Hands Free System‘ or ‘Pairing failed‘. Luckily, it’s fixable. Try the solution below in the order given. This is rather strange one. Bluetooth works fine with the car when playing music, using Maps, etc. but the moment the user tries to use Phone audio instead of car speakers, problems come to fore. To fix, use the solutions in the order they are given below until it’s solved. Like Issue no. 3 above, only when calls are being made or received, Bluetooth starts behaving odd. While it was working completely fine otherwise. Once again, try all the solutions below in the order given. This is a really good fix, confirmed to work by many people. To reset your Bluetooth settings, fire up the Settings app, and locate and tap on Backup & reset option. 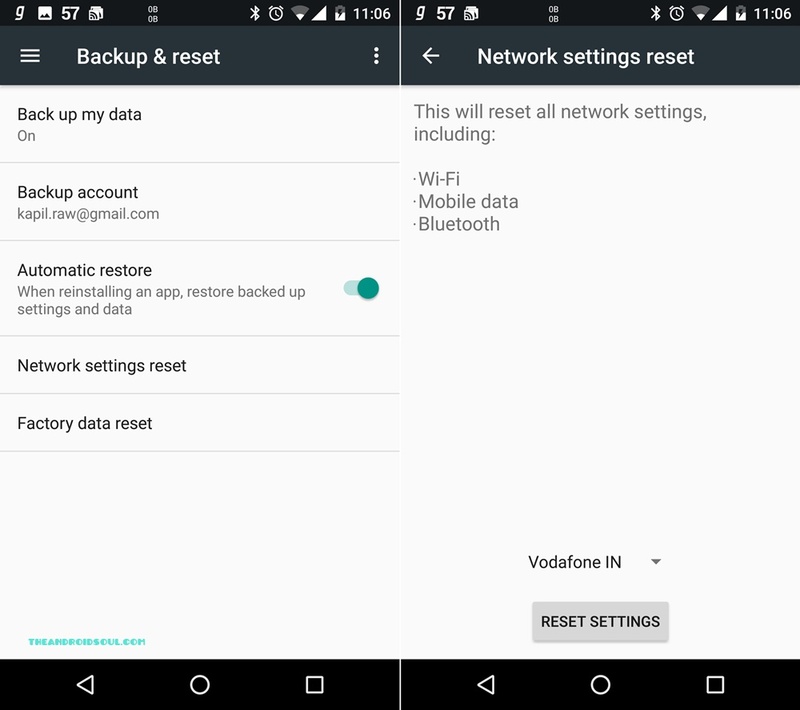 Now, touch ‘Network settings reset’, and then ‘Reset settings’. Confirm this on next screen. Note: This will reset all your settings related to WiFi, Bluetooth and mobile data. Keep that in mind. If you need WiFi urgently, then better do this later on. Especially when connecting with cars or older Bluetooth devices, try this easiest of all fixes given here. You get to input the pairing key when connecting the device to your Car, so fill in this passkey “0000” without quotes, and it should connect all fine. And work fine, too. Do let us know in comments if this works for you. Under this, first reboot into Safe mode. For that, with device on, press and hold power button to get a pop-up. Now, tap and hold the ‘Power off’ option, and then tap on OK to reboot into safe mode. Now, try to pair your Nougat device to your Bluetooth device, and see if it works totally fine, as it should. It shouldn’t disconnect, or run into problems over some features. If this doesn’t help then try the solution given below. And if it does, give us some love in commnets section below. Under this Bluetooth fix, you disconnect and unpair your Bluetooth devices, and then try to connect with Wi-Fi off. Here’s how. First up, unpair your Nougat devices with all Bluetooth devices first. Now, turn off Wi-Fi and Bluetooth. Give device a reboot. Make sure Wi-Fi and Bluetooth are off, if not, turn them off. Now, turn on only Bluetooth. Now pair it with your Bluetooth device, and see if it works alright. Do let us know if it works for you or not. There is a chance the popular Doze mode is causing problems with your Bluetooth. 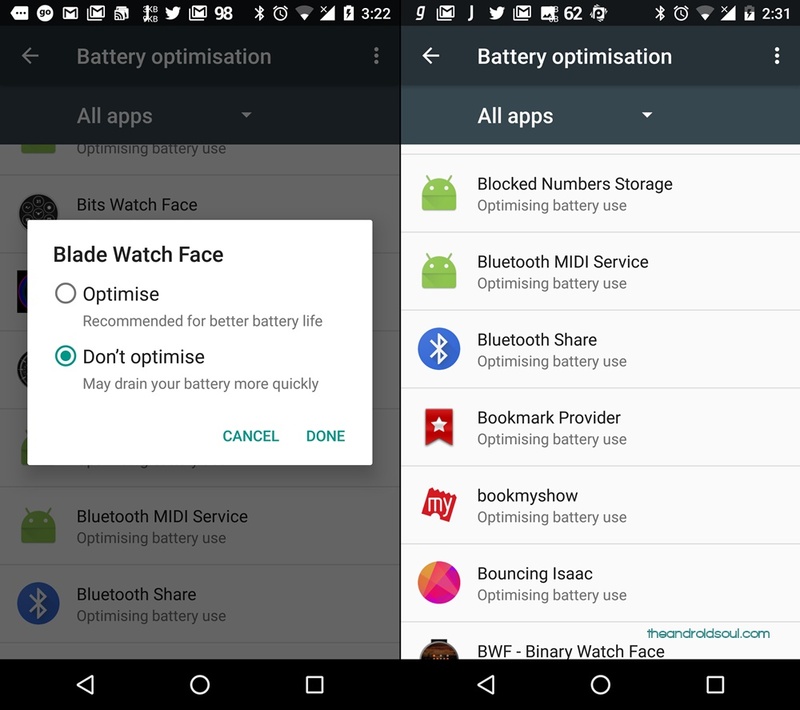 If that’s the case, you can try disabling the Doze on Bluetooth apps and services. Here’s a little guide for this. On your Nougat device, head over to Settings > Battery > tap in 3-dot menu at top right > tap on Battery optimisation. To show all apps and services here, select the ‘All apps’ options under the dropdown (tap on ‘Not optimised’ to get to it). Now, select tap on each of the Bluetooth services (Bluetooth MIDI service, Blocked Numbers Storage, etc.) and apps (Play Music, App music, Phone (calls), music player app of yours, etc.) and select ‘Don’t optimise’ option. You have to do this separately for each one of them. If the above solutions don’t work, do this. Go back to Android 6.0.1 Marshmallow by installing a factory image. (Download the factory image from here, and flash using this guide.) This will completely wipe your device, so be sure to take appropriate backups. Now, on Marshmallow, with Wi-Fi connected (or data), look for system updates. You should receive a notification to update to Android Nougat. However, if you don’t get the OTA update, then download the Nougat OTA, and install it yourself manually. This will do too. When on Android 7.0 Nougat, try pairing your devices again. They should work alright now. If you are still facing the issues over Bluetooth, then do let us know using the comments section below. And we’d love to know if this solution fixed the issue for you. 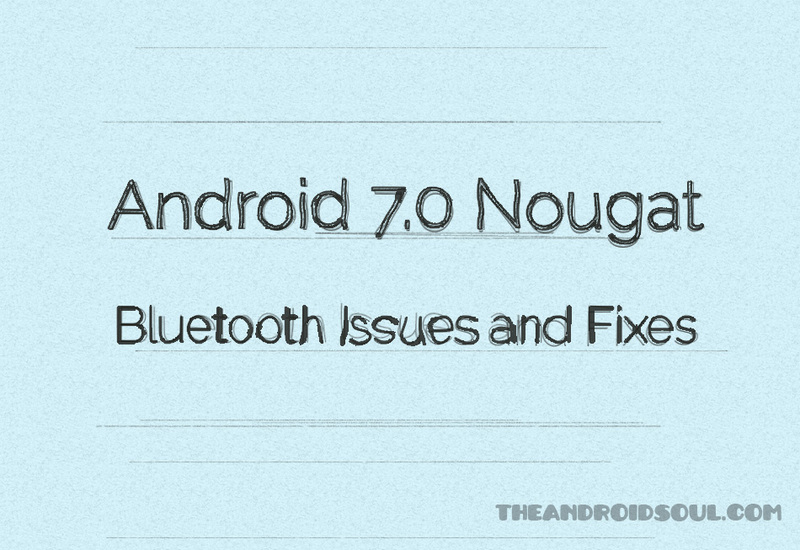 Do the above-mentioned Nougat Bluetooth solutions help you? 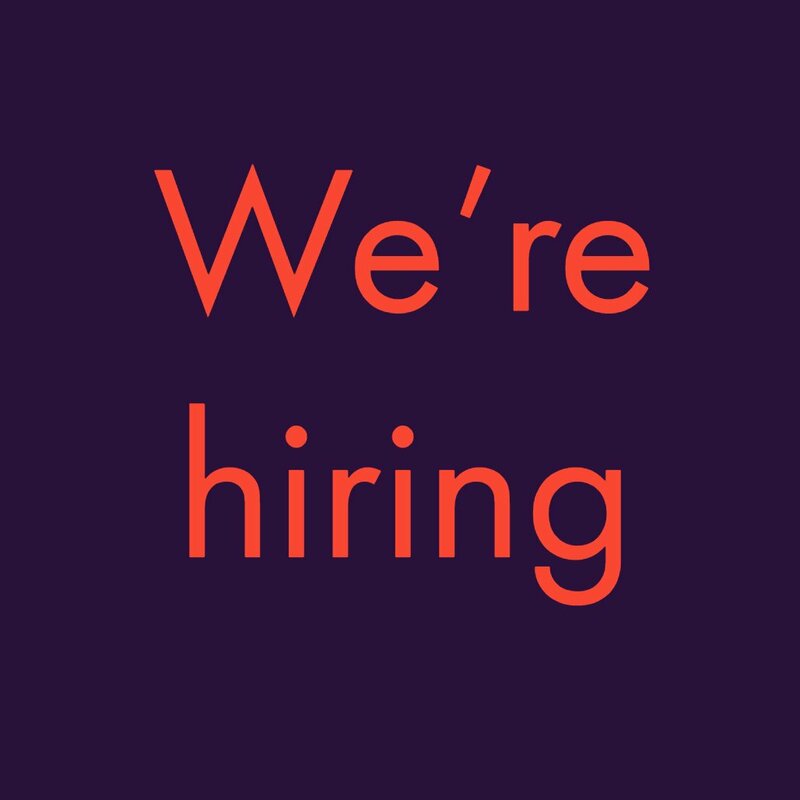 Do let us know in comments below. However, if none of the above Bluetooth fixes work out for you, then use the comments section below to elaborate the issue you are facing, and we will try out best to help you overcome it.